The final part of our trip .. and a last ditch attempt to complete the measly three posts in the same month. Weekends have been terribly busy with guests at home, and time is flying as usual. The Nile Cruise is one of the most common features on trips to Egypt. Only after getting there did we realize just how common it is. Like most typical tourists we went on a cruise between Luxor and Aswan. This is one of the most popular routes since the there are many well preserved temples en-route and it makes for interesting stops. There are nearly 300 cruise boats which ply on this route. This means that while the cruise is docked they literally park parallel to each other and sometimes you have to cross multiple ships to get to your ship - like in this picture where there are four ships together. The worst though is the for people who are on the ships in between and can't even leave their curtains drawn since they can literally climb through their neighbours window - its that close. 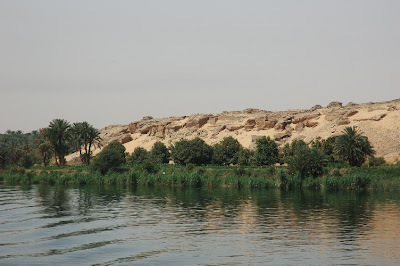 And if that was not disheartening enough, since the distance between Luxor and Aswan is not a lot, most of the time on the cruise is spent 'docked' rather than 'cruising'. With all the negatives out of the way, it was still a lot of fun. We visited lots of interesting temples. Most of the temples were breath-taking in their size and intricacy especially when you think of it in perspective of how old they are. Not for a minute did I get bored, though even till the end I had little idea of the chronology of the rulers of Egypt and had totally mixed up their pantheon of gods. Our guide explained some of the theories behind how Obelisks were made to stand and how carvings were done of such high walls, am not sure if they are accurate, but they made for interesting listening. Luxor was definitely the most interesting of the places along the Nile. 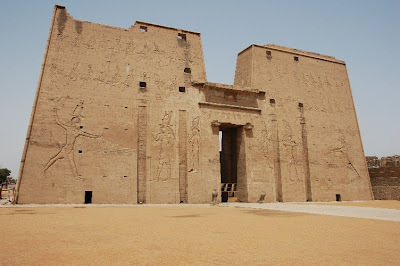 Apart from being the site of the largest temple complexes - Karnak Temple, I was most fascinated by the Valley of the Kings. I could not imagine a place so barren - such an apt representation of death. The tombs were also striking especially the vivid colours of elaborate paintings, most in their original forms without restoration seemed surreal. Photography is not allowed inside, but they would have made great pictures. One of the things which disturbed me was how many of the beautiful carvings had been destroyed by chiselling away of the features. This was a common theme across most of the temples we visited. From what the guide told us, as Christianity spread there was an intolerance by the Christian population for Paganism. The Christians wanted to spread the message of one 'God' and this resulted in removing the features of the 'many' gods represented on the ancient carvings. When Christianity became the official religion in three hundred something AD, the minority Christian population set about destroying tombs, carvings and burnt a library of papyrus scripts. What struck out in this story was the vicious destruction of beauty and the intolerance of another religion. To me it just seems so unacceptable. So much worse than when the Romans ruled Egypt and painted over their temple walls (a layer on top of the existing sculptures) with pictures of themselves. Atleast all that beauty remained below; it was not destroyed, just covered temporarily. It filled me with a certain helpless anger that people could get away with destruction in the name of religion. Someone mentioned that you feel similarly when you visit Rome and see so many beautiful ancient gods 'beheaded' because they represented the local pagan beliefs. It just makes me so angry and so sad at one level. I suppose it is things like this which makes me stay away from anything religious. Below is a picture of a carving that is intact and one that is destroyed. Not sure if it is clear enough to illustrate what I have been trying to describe. To end on a less serious note. Here are some other random pictures. In all it was a lovely trip and I highly recommend Egypt to anyone considering a holiday there. 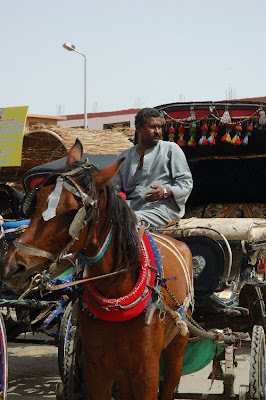 A horse carriage one takes to get to Edfu Temple. Very stinky!! Luxor Temple. 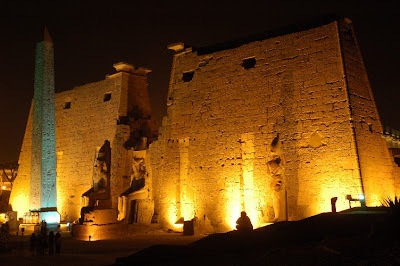 The bigger, Karnak temple, has a famous Sound & Light show. This was definitely the best part of the trip to Egypt. 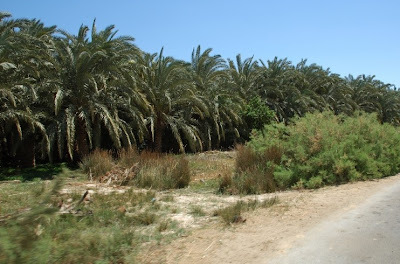 We were very lucky in finding a two day trip (with Minamar hotel in Bahariyya) into the desert, it was short, but one I will not forget easily. 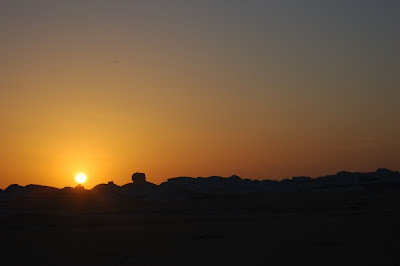 We set off from Cairo early in the morning in a 4X4 which took us into the desert. It was a long day with the expert driver crossing 100kmph for most of the way. He was fun and chatty and made a big difference to how enjoyable the trip was. Though he does this nearly every day during the tourist season, he never looked bored at our awestruck faces. 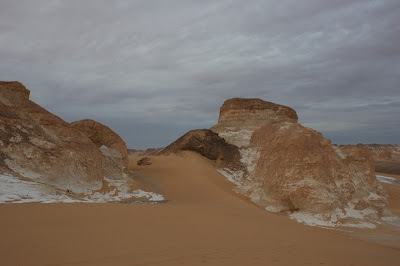 We went from Baraharriya Oasis to the White desert, a fairly common tourist route. What makes the trip most fascinating is that unlike a regular sandy desert, the desert formations are varied and change as you drive along. 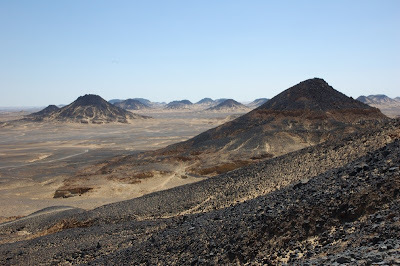 The first stop was at the Black desert (above), the vastness was enthralling, more so because in the vast desert there was not another person or car to be seen. Given the high formations which break the view, for most parts we felt like we were the only people in the pristine desert. The vastness filled me with a sensation I cannot describe. 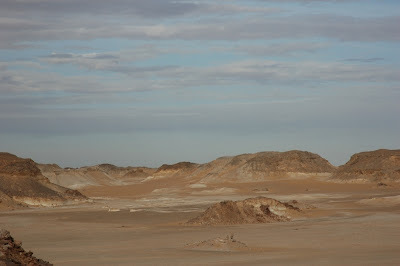 As we drove along the black desert gave way to a large more new formations and we came into the white desert. 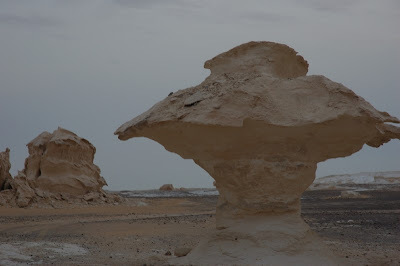 The white desert is made of chalk that has been exposed to natural forces which has sculpted it into various shapes. Some look like outlines of animals, trees and others just amorphous shapes. This is where we set up camp with the basic equipment carried in the jeep. The driver was the chef too and cooked us one of the best meals we had in Egypt. It was simple, and having it in the desert by the fire made it a venue difficult to replicate. While we were not the only people (as we could make out by the numerous camp-fires in the distance), the desert is large enough for people not to have to camp too close to each other. We hardly slept that night.. partly because the super dusty, dirty sleeping bag made it difficult to breathe. But waking up in the desert was totally worth the lack of sleep the previous night. The next morning we drove around a bit more, went to an area where we came across some 'desert rose' and finally drove back to Bahariyya Oasis. This is the first time I have been to an Oasis and the greenery in the middle of an arid desert looked so 'out-of-place'. Finally we were back and on our way to the Nile Cruise. What a stark contrast it was ..from having no bathroom one night to five star luxury. But for whatever roughing out it was .. it was totally worth it and here's the pictures to convince you of that. We were driving along when our driver took a detour to come here. I was speechless at how beautiful it was. 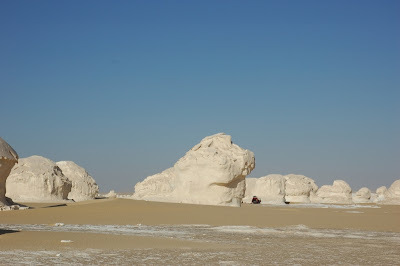 The white desert by day, really really white! Bahariyya Oasis, unbelievable how green it was in the middle of the desert. 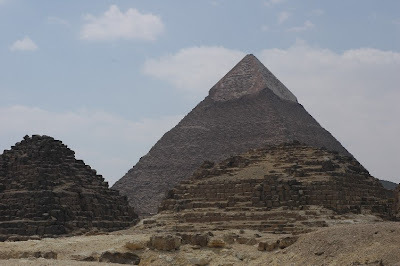 As someone had summarised well when we were planning our trip, there are four segments (for want of a better word) that can be part of a trip to Egypt - the cities, the western desert, along the Nile and the red sea region. After much planning we figured that it would be feasible to cover parts of the first three in the 10 days that we were there. 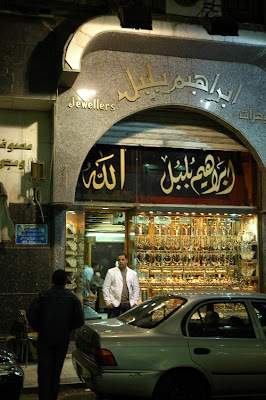 We based ourselves in Cairo and everything was from there. In between places we were back in Cairo and covered the city in 'bits and pieces'. My first impression of Egypt was how similar it is to India. The chaos, heat, dust .. it all seemed so familiar. Just the language was different, but never did I feel bewildered, it was like going home. 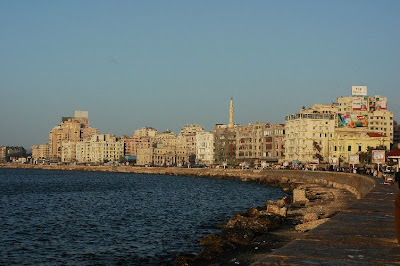 We visited Alexandria and Cairo. The two cities were quite different. Alexandria felt like being in Bombay. I suppose that was because walking along the Corniche was like being on Marine Drive. It had some interesting mosques and the largest greco-roman theatre in Egypt. We also got to eat some excellent sea-food (an unrelated point). More food focussed discoveries were made - early on in the trip we discovered super-cheap and super-yummy falafel in pita being sold on the roadside. Thereafter for the entire trip we abandoned our pre-paid buffet breakfast at the hotel for a far more delicious alternative. Most of our time in Alexandria was spent walking and the great weather and warm sunshine was welcome after the long winter of UK. While it was nice, if someone is short on time, I would say one could give Alexandria a miss in view of the other places we went to. 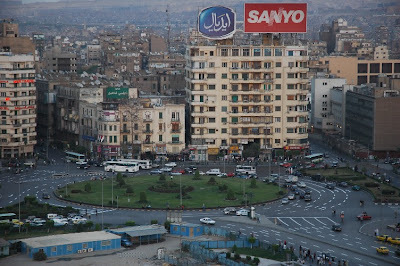 We spent three and a half days in Cairo. It is a very vibrant city and always awake. No matter how late in the night, the streets were always crowded. 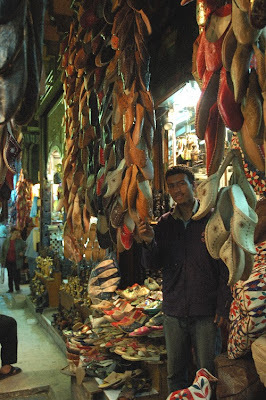 One of the most interesting places was Khan Al-Khalili market. While it was rows of shops selling very similar things, the colour and crowd was so amazingly full of life. It was nice to be in the midst of so much activity. Though after a while the shopping part got boring, I could have spent a lot more time just looking at the people and the place. We did the other usual touristy things like visiting Coptic Cairo and walking along the Nile. One of the mornings was spent in a very unsatisfying visit to the Egyptian museum. Everyone had suggested we get a guide, and after putting all our combined negotiation skills to use we got a pretty bad deal. The guide just herded us through the place like cattle and kept adding more people to the group as we went along. It is a place with so much to offer and our breezy tour did not do it justice. As was expected one of the most interesting parts was the very expensive mummy rooms. To think that the bodies are thousands and thousands of years old and still perfectly recognizable, it is unbelievable. The other highlight was ofcourse visiting the pyramids. Like most things one hears so much about, it was a bit of an anti-climax. The crowds of visitors and people selling things was too overwhelming to take in the magnificence of the pyramids.. and though I knew what to expect, somehow seeing them was not quite the same. So that was the cities. While these were interesting, they paled in comparison to the next bit - the trip into the Western Desert. That's for next time, till then a couple of other random pictures. ..and ofcourse - The Pyramids! What a wonderful holiday! I totally agree with the apt description by 30in2005 on the difference between a holiday,a break and going to India. This was the first time I have been on a real holiday .. unlike all my earlier long breaks which usually involved staying with friends or travelling on work for 10 days ..even to Goa. Though we had planned and planned and planned the house work and getting everything sorted before we left, we didn't do a thing. Even the packing was left for last minute and much as I hated it, the house was left in a total mess. Ofcourse all was forgotten during the next ten days in wonderful Egypt. I could'nt have imagined a better holiday. We travelled a lot. Used every mode of transport we came across - cab, metro, 4X4, felucca, horse drawn buggy, long distance train, cruise ship...the list goes on. Thankfully we also got along very well with friends we had gone with.. and spent many fun hours just chatting. You can expect to be bored by a long multi-part account coming up on details of the trip (accompanied by pictures)..which will be laden with my nostalgia and only useful if you are planning a trip to Egypt, something I highly recommend. And while I would love to start off right away, I need to clear the frightful mess since the beginning of the warm summer is bringing with it the warmth of guests who arrive day after tomorrow.